Affordable decade boxes with rugged quality and high precision. Perfect for educational use, R and D, service, production line testing and maintenance. 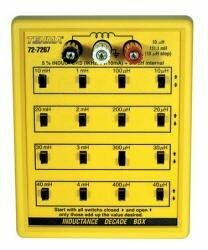 Model LBOX-405 Inductance Decade Box * Sturdy, multi-way binding posts * Slide switches add/subtract for desired value * Durable ABS plastic housing case * 10uH to 111.1 mH, wide range and high resolution * Four decades of inductance * Slide switches that allow the user to simply add or subtract for desire value.